RESTORATION DAY OF HAWAII NEI. More on Restoration Day, 1843.
Who does not know the truth of this statement? He must read the Bible; it is there that he will see the truth in this statement. What of Pharaoh [Parao], the ruler of Egypt [Aigupita], the one who overburdened and oppressed the Israelites? Did he not die at once, along with all of his warriors in the Red Sea? And with his quick death in the Red Sea, what happened to Moses and his people? Did they not sing, exalt, rejoice, and praise God for his saving them from the hands of their enemy? Read Exodus [Pukaana] chapter 14 and chapter 15, and there it will be clarified. 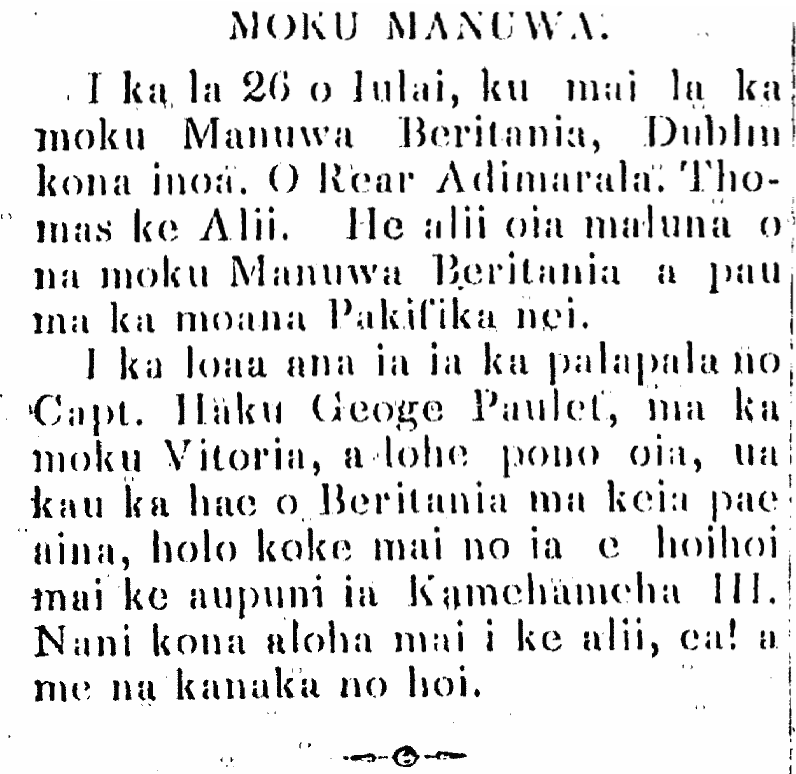 Ka Nonanona, Buke 3, Pepa 6, Aoao 27. Augate 8, 1843. Richard Thomas arrives today, 1843. On the 26th of July, the British Warship named Dublin arrived. Read Admiral Thomas is the Captain. He is the commander-in-chief of the British Warships here in the Pacific Ocean. When he received the document about Capt. Lord George Paulet, by way of the ship Victoria, and he heard clearly that the flag of Britain was raised at this archipelago, he quickly came to restore the kingdom to Kamehameha III. How wonderful indeed is his aloha for the king! and for the people as well.